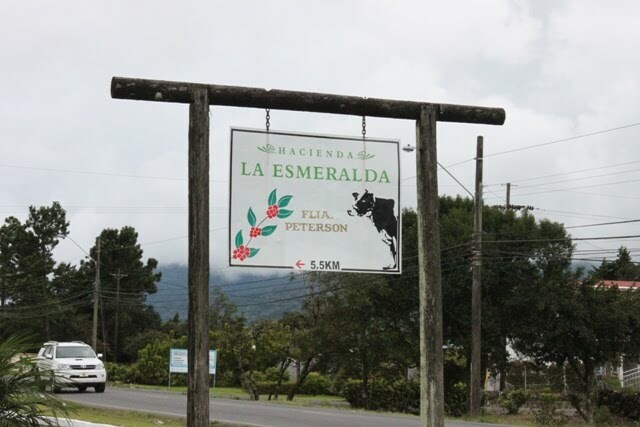 The coffee from Hacienda La Esmeralda inspired the title for the recent coffee book "God in a Cup". For sure the coffee Hacienda La Esmeralda Special is extraodinary. Especially the intense elegant toparomas like bergamot in the coffee makes it very unique. As great fans of this coffee Anne Stine and I had looked very much forward to visiting the Hacienda and try to get an idea of why their coffee is so fantastic. Its not easy to find out why the coffee is that special but I will try to share some impressions I got during the visit. 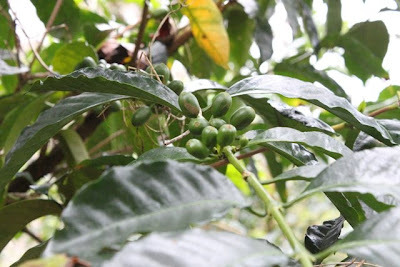 This time of year is actually rainy season and the good coffees cherrys are still green not ready to be harvested yet. On the picture is the long "Geisha" cherries. 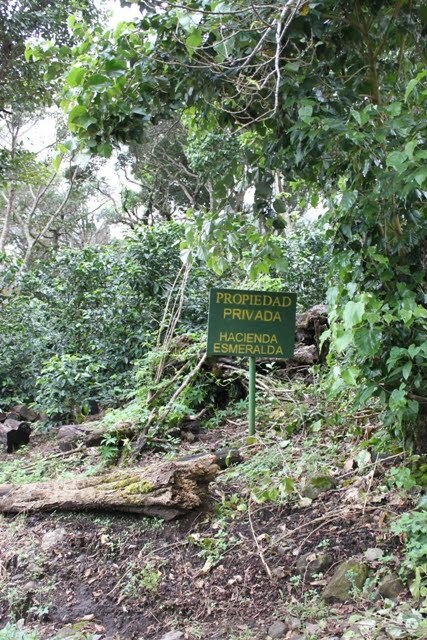 This variety is definetly part of the explanation of why the coffee from Hacienda La Esmeralda is so good, but alone it is not the explanation because it is possible to get "geisha" from other producers which does not have the same intense toparomas and some even doesn't have these toparomas at all. 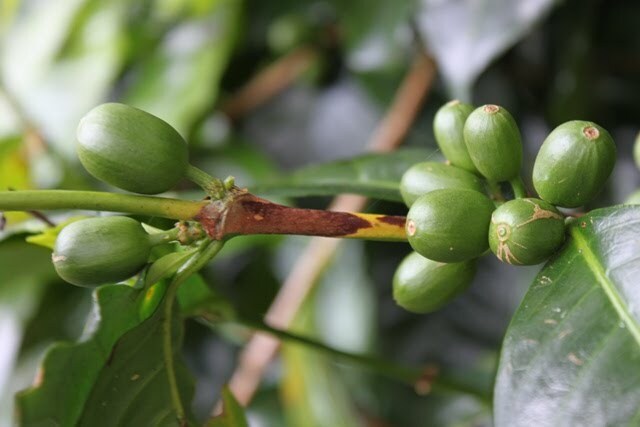 Another interesting thing about the geisha is the lower yield it has. 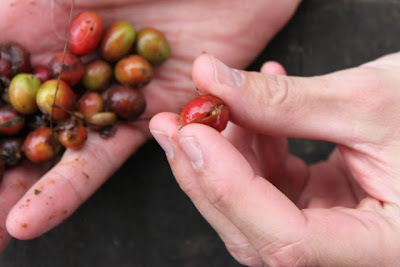 The ”geisha” tree would only produce around half the cherries of the Caturra. To me this is interesting because from my experience in general trees in Ethiopia and Kenya carry much less fruits than often seen in Central America. Would there be a relation between the sparser number of fruits on each tree and the more floral og berry-like aromas often found in Ethiopian and Kenyan coffees. From a biolgical perspective one could make the hypothesis that a lower number of fruits, everything else equal (which of course seldom is the case), would allow the tree to give more nutrients and energy to each individual cherry and in this way potentally making the aroma more complex in the direction of floral and berrynotes!? In any case we had the chance to blind cup a ”Geisha” lot that the Petersons did not find good enough for the auction against their ”Diamond mountain” which consists of ”ordinary” varieties including caturra and catuaí. 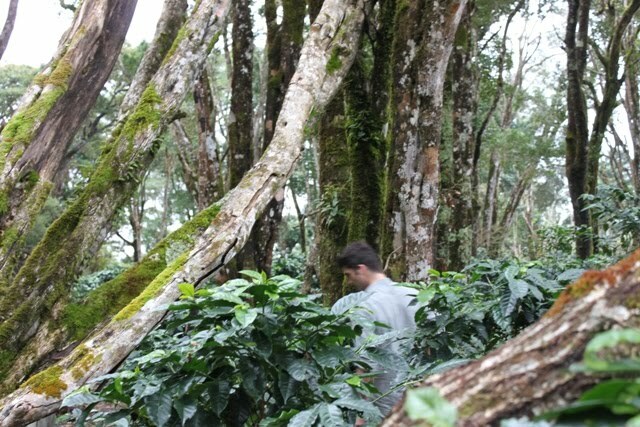 The Diamond Moutain is a really nice clean, sweet and balanced coffee grown at hights around 1400 msl. 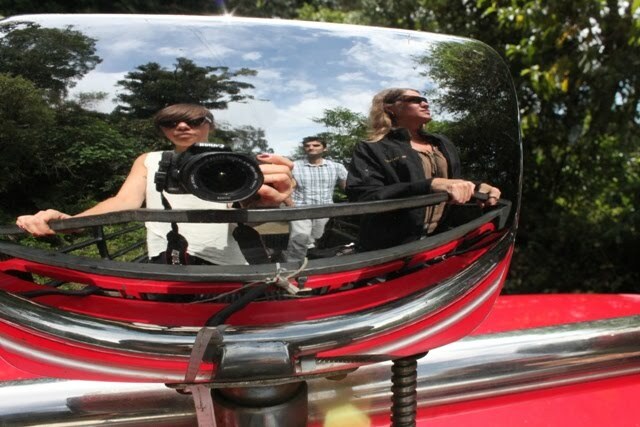 Which is the lower limit of where the Petersons grow their ”Geisha”. Actually the Colgá lot which we bought is situated at this height as well. Already in the dry fragrance there was no doubt which was the geisha and which was the Diamond. The diamond had a deep sweet pleasent aroma whereas the ”geisha” had a wonderfull bergamot like aroma (to me very typical for their unique ”geisha”). This of course is no proof of the hypothesis but merely showing the different chareteristics of the different varieties. Thursday we got the chance to walk through the Colgá lot. It seemed alomst like walking through rainforest. There were a lot of indigeniuos shade trees, it was really humid and moss was growing on the trees. The soil was also rich, dark and very soft as in a good wet forest. When we walked through the fields we were passing along the neibourghs field as well. 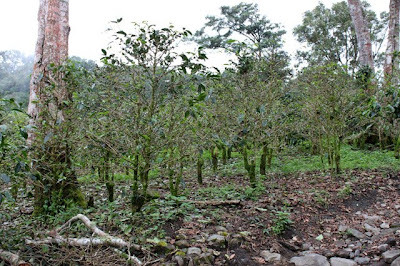 It was striking to see how different the trees at Hacienda La Esmeralda (on the left) looked from the neibourghs trees (on the right below). The trees at La Esmeralda looked very healthy, green and fertile whereas the neibouring trees really looked like the were missing something – probably at least nutrients. The leafs were sparse and yellowish in color. We had the pleasure of having lunch at Price and Susan Petersons residence. They served us a wonderfull and very tasty lunch and this was accompanied by some very interesting talks about coffee quality. Price shared with us how much he appreciated the work of the Gnobe Indians who came to the Hacienda in the harvest to pick. 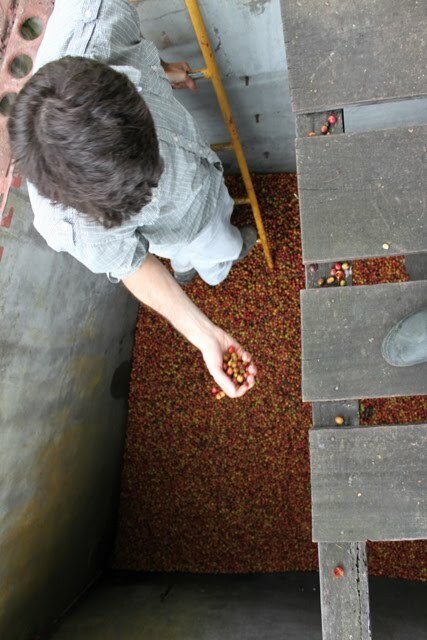 They were extremely carefull in their picking and as such were extremely skilled at only picking fully ripe cherries (the foundation of all good coffees but sometimes a struggle for the miller to achieve). Since we visited before real harvest time unfortunately we did not get to meet any of the Gnobe Indians this time. Back at the mill the very first coffee was coming in. This was from some lower lots that also belongs to the Hacienda but has nothing to do with the Hacienda La Esmeralda Special. The cherries was picked not because they were fully ripe but because their skin was breaking up - maybe because of a overpressure of water in the pulp of the cherry. This is the first time they go to the field to pick, what they call "the first cut" . It was not a Geisha lot they picked here but they will do the same thing with these lots later in the season. Actually they will do up to 10 cuts on each of the "geisha" lots. They will cup each of the cuts and decide if it will end up in the Special or not. Normally the first two cuts and the last one will not qualify. 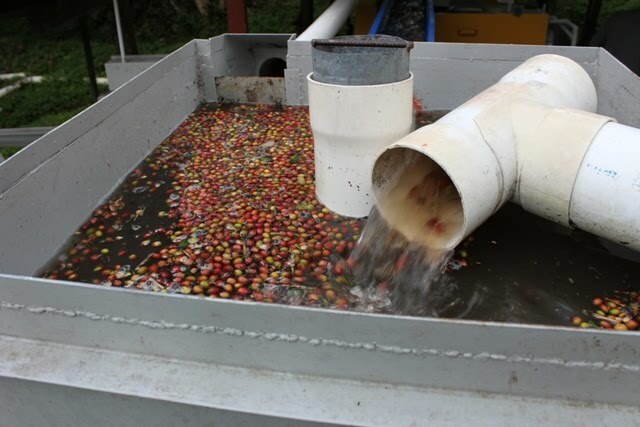 After the reciving tanks the coffee cherries are transported to the depulper but on the way they had installed a cyclone. The Cyclon basically seperates out not fully ripe cherries, leafs and sticks since they all float on top. The fully ripe cherries will sink to the bottom and from there they continue to the depulper. 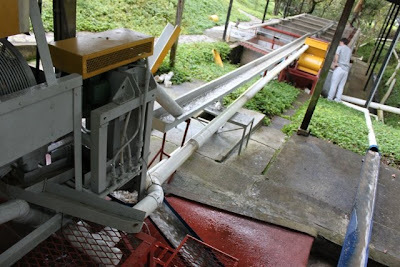 At the mill at Hacienda La Esmeralda they have a mechanical demucilator. They have compared the coffee from the mechanical demucilator with the fermented and washed coffee. 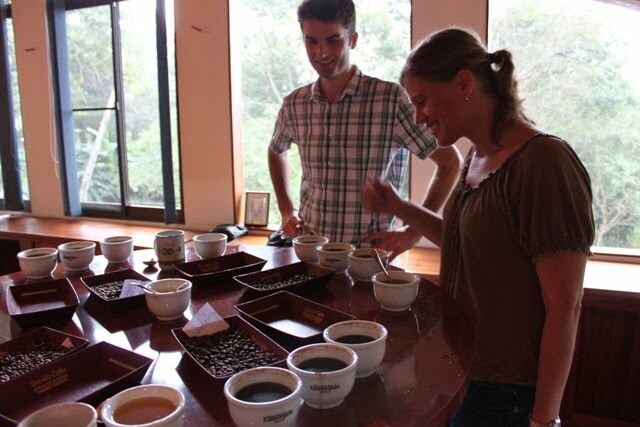 In their cuppings the aromas of the mechanically demucilated ”geisha” was as good as in a fermented and washed ”geisha”. Since the mechanical demucilator reduces the risks of poorly fermentation affecting taste they have choosen this method. I must admit that I am a bit suprised that it is possible to produce a coffee with such intense toparomas without the fermentation. In my mind this really is questioning some of what I thought was basic advantages of the washed method! 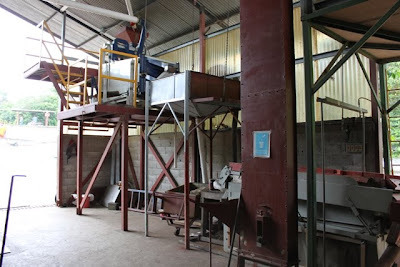 Another thing that stroke me was that at Hacienda La Esmeralda they have their own (small) dry mill. This gives them control over the entire quality developing process in the producing country. It was clear that Hacienda La Esmeralda is driven by people who are both very good at their job and very curious to find out how they eventually could improve. 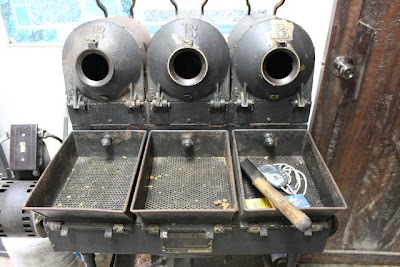 They had their own little test field with different varities, they had ongoing test where they made comparative cuppings of how quality is effected by forinstance altitude or by the age of the tree. 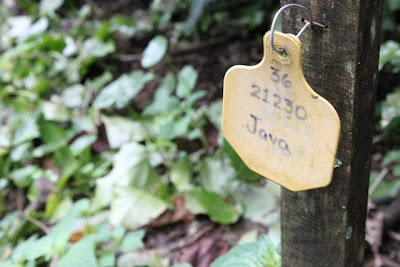 This ongoing research is very impressing and for sure must be part of the explanation why the coffee Hacienda La Esmeralda Special is so very special! Very interesting theory/points on the less fruit more fruit taste. I love the pictures.